Valproic acid is a branched chain aliphatic carboxylic acid which is widely used as antiepileptic drug. Valproic acid-induced acute pancreatitis is an uncommon cause of acute pancreatitis. Hereby we describe a 23-year-old unmarried female, who developed acute pancreatitis following the 12 th day of valproate monotherapy prescribed for seizure disorder. Valproate was immediately stopped and replaced with levetiracetam. She improved on conservative management. A 23-year-old female was admitted to our emergency department with complaints of pain abdomen and vomiting for 2 days. Pain was localized to epigastrium, severe in nature, continuous and radiating to back. Pain was worsening with duration. On general examination, patient was afebrile and there was no pallor or icterus. Vitals were stable. Abdomen examination showed tender epigastrium without any guarding or rigidity. Rest of the systemic examinations was normal. There was no history of jaundice, trauma, alcoholism, recent surgical intervention, diabetes mellitus, history suggestive of vasculitis, inflammatory bowel disease or any similar episodes of abdominal pain in past. On enquiry, we revealed that she was taking tablet valprol CR 500 mg twice a day for a newly diagnosed seizure disorder. On the 12 th day, after starting medication she developed pain abdomen which was not relieved by painkillers. On investigations, hemoglobin 12.2 g/dl, total leukocyte count 4600/mm 3 , and platelet count 260,000/mm 3 . Serum Na + /K + /Ca ++ /Mg ++ , liver function test, renal function test, and lipid profile were within normal limit. Serum amylase and lipase were 2100 U/L and 1900 U/L, respectively. Chest X-ray and electrocardiography were normal. 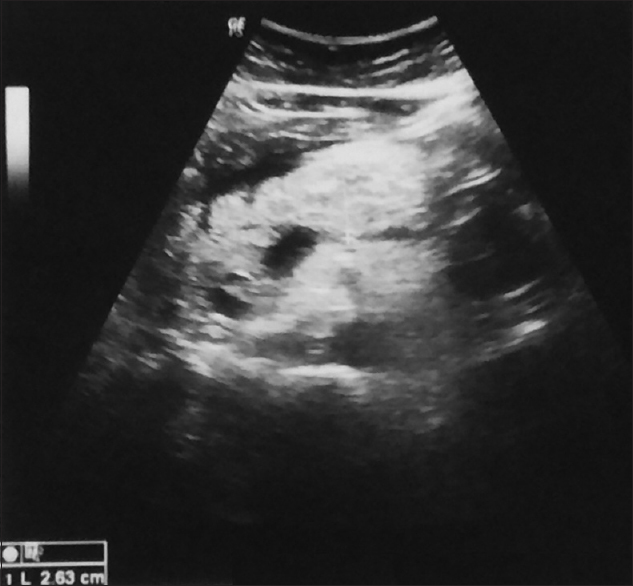 Ultrasonography (USG) of abdomen demonstrated bulky pancreas with irregular margins suggestive of acute pancreatitis [Figure 1]. On the basis of clinical signs and symptoms, acute pancreatitis was suspected. Later on, the increased levels of serum lipase and amylase confirmed the clinical suspicion. Other causes of acute pancreatitis were excluded and final diagnosis of valproate-induced acute pancreatitis was established. Valproate was immediately stopped and replaced with intravenous levetiracetam. She was kept nil per oral and managed with intravenous fluid and analgesics. Abdominal pain subsided, and she was initiated to take orally. Serum amylase and lipase were normalized after 14 days. The patient was discharged on oral levetiracetam 500 mg twice a day and call for regular visit in outpatient department. She responded well to oral levetiracetam in our 4 months follow-up. It is reported that most cases are mild and self limiting, and withdrawal of valproic acid normalize the levels of serum lipase and amylase levels with disappearance of the symptomology. While our case was presented with severe episode of pain in abdomen who was recovered fully on conservative management. Drug-induced pancreatitis is a relative rare entity, but should not be overlooked in a patient who presents with idiopathic acute pancreatitis. This case report highlights that high index of suspicion is needed in patients taking valproic acid and the medicine should also be avoided in future to prevent reoccurrence of pancreatitis. Hamad AE, Fawzi ME. Valproate associated acute pancreatitis. Neurosciences (Riyadh) 2000;5:156-8. Singh J, Dinkar A, Gupta KK. Enteric fever complicated to acute pancreatitis; a case report. IJSR 2014;3:1017-18. Singh J, Dinkar A, Atam V, Atam I. An uncommon Presentation of severe Falciparum Malaria: Acute Pancreatitis. I Int Res J Medical Sci 2014;2:1-5. Gerstner T, Büsing D, Bell N, Longin E, Kasper JM, Klostermann W, et al. Valproic acid-induced pancreatitis: 16 new cases and a review of the literature. J Gastroenterol 2007;42:39-48. Lowenstein DH. Seizures and epilepsy. In: Kasper DL, Hauser SL, Jameson JL, Fauci AS, Longo DL, Loscalzo J, editors. Harrison's Principles of Internal Medicine. 19 th ed. New York: McGraw Hill; 2015. p. 2542-59. Batalden PB, Van Dyne BJ, Cloyd J. Pancreatitis associated with valproic acid therapy. Pediatrics 1979;64:520-2. Sanfey H, Bulkley GB, Cameron JL. The role of oxygen-derived free radicals in the pathogenesis of acute pancreatitis. Ann Surg 1984;200:405-13. Steinberg W, Tenner S. Acute pancreatitis. N Engl J Med 1994;330:1198-210. Sinclair DB, Berg M, Breault R. Valproic acid-induced pancreatitis in childhood epilepsy: Case series and review. J Child Neurol 2004;19:498-502.